I wasn’t raised on frybread. Maybe that’s what encouraged me to drive two hours through New Mexico’s lava fields below the mesas westward toward the Navajo Nation, the largest of all American Indian reservations. If you’ve been to the Four Corners, you’ve been to the Navajo Nation, which largely falls in Arizona. But I exited I-40 just before the state line in Gallup, with a population just under 22,000. The people of Gallup were raised on frybread. One could, conceivably, compare Navajo frybread to carnival and country fair staples like elephant ears and funnel cake, but one could also compare éclairs to Twinkies if one had the impudence. More accurately, it’s akin to Spanish and Latin American sopapilla in that it’s a round, fried, quick bread that can be served sweet or savory. Because it consists of flour, some salt, and baking powder and is fried (typically in lard), I’m going to risk offense and call it an Indian doughnut—if doughnuts were humongous and hearty and perhaps more delicious than any standard doughnut you’ve ever had. Fifty-two Saturdays a year, the Gallup Flea Market is home to acres of vendors selling everything from handmade jewelry to used tools to 50-pound sacks of salted peanuts (price tag: $85). A much better snack, and value, is frybread. Wander around and you’ll find several booths offering freshly-fried discs of dough the size of Frisbees. Like snowflakes and fingerprints, each one is unique in its bubbles and waves, its peaks and valleys. Roughly a foot in diameter, the mounds can measure two inches tall while the craters and crags are half an inch thick. They’re gold on the outside, tan on the inside. Best of all, any given bite yields either a flaky, crispy chomp or a soft and tender chew. For fear of dwarfing your face, it’s probably best to tear off a strip before eating—but maybe pack a Wet-Nap if you’re the type to sweeten it with streaks of honey and a sprinkling of powdered sugar, as all the stalls have self-serve honey bears and sugar jars. But they also have salt shakers, and I witnessed a near equal number of folks reaching for one or the other. A few made use of both options. Now here’s where things get kicked up a notch as far as frybread’s role as a sweet versus savory snack. Dig it: Navajo tacos. Don’t mistake this for a mash-up akin to a Paula Deensian-substitution of a pair of Krispy Kreme doughnuts for a burger bun. The glory that is a Navajo taco, for all intents and purposes, deems frybread and tortillas fungible. So the frybread becomes the base for, say, ground beef (often a hamburger patty, but please don’t call it a taco-burger), refried beans, chopped tomatoes, and shredded lettuce and cheese. The most important aspect of frybread is that while it’s a snacky form of sustenance, it’s also a cherished symbol of Navajo resilience. While the Trail Of Tears—the forced relocation of Native Americans to Oklahoma in which several thousand members of the Cherokee Nation and other tribes died—receives short shrift in high school history textbooks, even less discussed is the Long Walk, which began in 1864 a few years after the Trail Of Tears ended. This forced relocation of the Navajo from lands in Arizona to New Mexico displaced fewer people and resulted in fewer deaths, but that doesn’t make it less of a shameful tragedy. I learned more about the Long Walk and how it led to the creation of frybread from Vina Begay, a librarian and archivist at the Indian Pueblo Cultural Center in Albuquerque. Although the center obviously focuses on the 19 tribes of Pueblo Indians in New Mexico, Begay is Navajo. She informed me that there wasn’t a single document dedicated to frybread, but that’s logical since its history and preparation are passed down orally by elders. As Begay explained, the Navajos’ original diet consisted largely of healthy crops. But U.S. government troops gave them unfamiliar rations—including flour, sugar, and lard—without any sort of instructions on what to do with them. Initially combining them to create a paste, some people perished from starvation or dysentery before arriving in New Mexico. Eventually, these rations resulted in fried dough. Years later, during intertribal pow-wows, this food item spread to other tribes. Cherokee fry bread in taco form became such a staple of the Oklahoma diet that the National Indian Taco Championship was created in Pawhuska, Oklahoma in 2003. And Sioux fry bread became the official state bread of South Dakota in 2005. 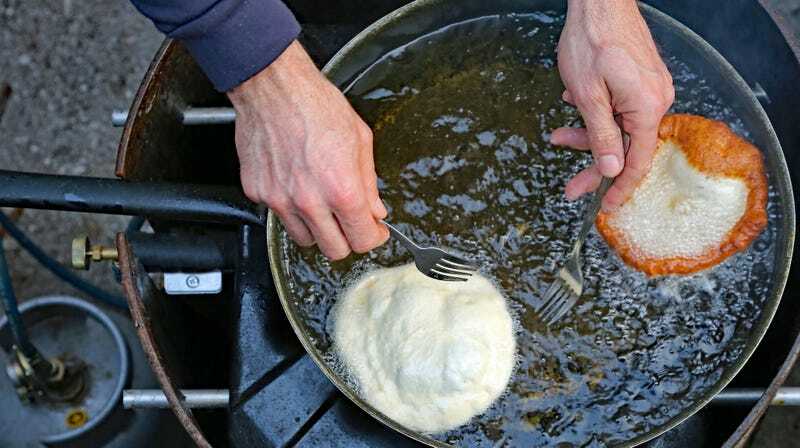 Collectively known as Indian frybread and Indian tacos, its origin as Navajo frybread in the Southwest means it’s almost always made with Bluebird Flour. Milled in Cortez, located a couple hours north of Gallup in Southwest Colorado, the telltale cotton sacks of flour can be found repurposed as stockings or casings for stuffed animals at several stalls in the Gallup Flea Market. The Platero family makes some of the most popular frybread at the market, which I base entirely on my observation that they had the longest lines and sold out the soonest. Frances Platero and a rotating cast of her seven granddaughters—four on the Saturday I visited—take turns with various stages of frybread preparation. They make the dough at home, but one creates softball-sized spheres before handing them to another, who rolls them out, who then slips them to Frances, who is in charge of frying. No set recipe, no timer, it’s all made by instinct, down to flipping the dough once the edges turn golden brown and the bubbles start to form. Selling the bread for only a buck a piece, the Platero women work quite efficiently for their income. You can’t put a price on the scrumptiousness, or solemnity, of hot, chewy frybread. But I would have paid more than a dollar.